Heading south/southeast from the Milos Mining Museum, after 2.3 km on the Adamas coastal road you will come to a main intersection. Turn left toward Zephyria, where this route begins. In ancient times Zephyria was one of the names by which the island was known. In his Natural History Pliny the Elder says that Aristotle called Milos by that name (which is etymologically connected with Zephyrus, the West Wind), as it belonged to the western Cyclades. Zephyria was the capital of the island, named “Milos” or “Chora”, from the middle of Venetian through the end of Ottoman rule, and in 1901, by decision of the City Council, the island took its current name. In 1207 the Venetians occupied the island and settled in the Castle (Plaka), which offered them greater protection from raids. Half a century later (1350-75 AD) they built a tower in the area of the current Zephyria to monitor the harvest and the collection of taxes. A small settlement soon grew around the tower, which was fortified with walls and a moat, and gradually spread beyond the walls. The settlement enjoyed significant economic development, and soon the Frankish rulers and the Venetian bishop transferred their seats there, proclaiming it the island’s capital, with “Protothalassa”, the current Kanava, as its port. The Church of the Assumption or of Panaghia Portiani in Zephyria was the cathedral of the island, and popular assemblies were held in its courtyard. There followed four centuries of prosperity until Zephyria began to decline, mainly due to the morbidity of the climate. The mysterious “disease of Milos”, as foreigners called this “morbidity”, was perhaps related to malaria (due to the then marshy land adjacent to the current salt ponds). 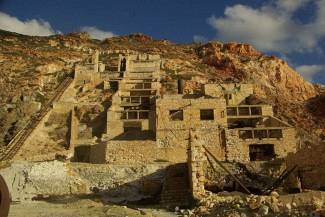 This fact, in conjunction with local earthquakes that occurred during that period, contributed to the abandonment of Chora, culminating in 1767, the year of the “Great Dying.” However, Chora was never completely uninhabited and later, with steps taken to combat malaria and with mining operations running nearby (mainly sulfur but also kaolin mines), its population hung on and gradually increased. Plaka had now become the island’s capital, however, with Adamas as its port, having already been colonized by Cretans (Sfakians). The cathedral of Panaghia Portiani dominates the center of Zephyria (P1). It was the seat of the bishop of the island’s old capital and the only public church (the others – churches and chapels – in the country-area or Kampos were privately owned), a fact which accounts for its rescue, after the abandonment of Zephyria. The exact date of its construction is unknown, but must be before 1576, as witnessed by an inscription. The inscription 1645, on the lintel of the main entrance, must relate to one of the church’s renovations. The temple was built almost entirely of perlite, as were almost all structures in the old capital, according to the traveller Tournefort. It stands adjacent to the outer walls of the older church of Aghios Haralambos. A site worth seeing is the Church of Christ (P2), standing in the fields immediately past the village’s last houses, which you can see by making a little detour, just 200 meters north of Panaghia Portiani. Although its roof has fallen in, the unique architecture with its large arches, catches the eye, leaving it up to your imagination to complete the picture of what it must have once been like. It is worth noting that this Church, too, was built out of perlite. The plain surrounding Zephyria is an area of low elevation, which is marked in the east by a large fault line running in a N-S direction. At the higher eastern part which you will soon cross, the ground has undergone intense erosion along the streams. You will notice strongly weathered tuffs, i.e. natural cuts, covered over a large area by mud flows (“lachars”), consisting of heterogeneous and unrelated materials, such as metamorphic conglomerates, but also limestones and volcanic rocks with fine-grained material. Leaving Zephyria and its large plain behind, the dirt road follows Langada creek by the streambed. Along its sloping sides, clumps of junipers (Juniperus phoenicea), conifers the needles of which resemble those of the cypress, but also many wild olives (Olea europaea var. silvestris) and mastic trees (Pistacia lentiscus) color the landscape. An interesting mineral that is worth discovering here is gypsum. At the point where you see the sign “To Point of Interest P5”, you are being summoned for a short hike. Leave your vehicle on the main dirt road and walk uphill on a rough dirt road heading south. Gypsum occurs by the sides of the road (P4) in veins – crusts – aggregates within clay material. It is obvious that gypsum developed in cracks or the preexisting rocks, which have been so strongly altered that they have lost their consistency, and erosion from rainwater has exposed the bright, clear gypsum crystals. After this brief pause, backtrack to where you left your vehicle so that you can continue on the main dirt road that climbs into the green gully. 1.3 km after Panaghia Portiani, you will notice that part of the dirt road is paved with stones (P5). This was a technical project to improve the passability of the road so well carried out in the 1950s by the company operating the Sulfur Mine of Milos that the road has remained intact up to the present. To your left, on the uphill slope of the road white-gray tuff sediments appear, which have undergone silica diagenesis – leaching and have light, microporous thin parallel layers. Along the slopes of the ravine you will also notice in many places galleries where white kaolin was mined. Because of its iron oxide content, Milos kaolin is not very white. Nevertheless, in the past, when there was small-scale exploitation of kaolin for applications in ceramics, white kaolin was mostly mined by means of these galleries. This went on until quite recently, in this area, with the kaolin destined for the cement industry. Rich in sulfur, alunite, silicates and iron oxides, kaolin in this area becomes entirely red in some cases. The kaolin mine at Kastriani (P6) is owned by S&B Industrial Minerals S.A. and is currently undergoing environmental reclamation based on proven practices. At the mine, from which a 17 m. layer of overburden material has been removed above the kaolin deposit, the landscape has been successfully restored by planting of special plants on an embankment along the front of the mine. Here, kaolin was mined in open pits while in the past kaolin extraction was carried out in small galleries at places selected on the basis of the quality, whiteness, and content of their kaolin deposits. Kaolin, here, was created by the action of fumaroles on the volcanic rocks as a result of the alteration of feldspars and volcanic glass. This mine operated until recently to produce three grades of kaolin: for white cements and for paper making, and as filler after processing in S&B’s dryers and mills in Voudia Bay. Shortly after the S&B kaolin mine, at the spot where you see the sign “To Points of Interest P8 and P9”, two interesting sights await you, after leaving the main dirt road for a short secondary route on your left. The first is the beautiful church of Panaghia Kastriani (P7). Some ancient architectural elements are still visible in its masonry. A column, a capital, and part of a marble sarcophagus are evidence of its exceptional architectural character. Given that no surface limestone deposits exist on Milos, any constructions made of marble, owe their marble raw materials to “imports” from various parts of Greece. The church is not open to visitors, but you can get a full inside view through the window on the north wall. 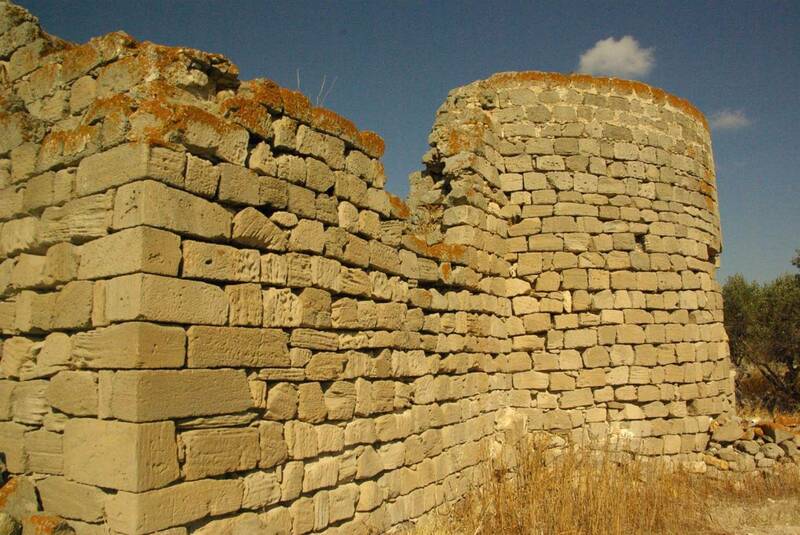 It is dedicated to “Zoodochos Pigi” (the Life-giving Source), but the name Kastriani prevailed because of a wall that formerly surrounded the hilltop where it was built, giving the impression of a castle. The French traveler Tournefort mentions that around 1700 it belonged to the Zoodochos Pigi monastery. The bas-relief above the entrance in reddish brown pumice stone and the decorative rosette carved in relief above it are worth admiring, while the built-in table and benches in the courtyard are ideal for relaxing, offering unlimited views of the valley and beyond, to the airport and Adamas bay. The second attraction in Kastriani is an old farmhouse (P8) and its storage and utility rooms carved into the soft rock. In this area there are two large mines. The first of these is a 20-hectare open-pit mine with benches (5×5 m), where the “Lava Mining” company (a subsidiary of “Hercules Cement” of the LAFARGE group) extracted a white siliceous material (microcrystalline quartz with an idiomorphic origin). At the entrance to the mine (entrance prohibited) and in some parts of the mining terraces, one can see deposits of native sulfur and boulders (from the overburden material of the mine) with alunite, fine examples of native sulfur, and gypsum. Within the mine one can see ancient galleries for the exploitation of sulfur and alum. The second is the Fili mine, an exhausted kaolin mine, where restoration work has not yet begun. The exposed mine sections help with the study of the origins of kaolin. In some parts of the cuts yellow-red oxidations are visible. The quality of the kaolin varies, because of the iron oxide (red) and alunite impurities. One can see the old galleries, where the exploitation of high-quality kaolin took place, as well as the new mining faces, where kaolin was extracted in larger quantities of lower quality (in terms of color and impurities). Returning to the main dirt road, continue in an easterly direction. About 300 meters past the crossroads for the first secondary route, you get out of the Langada ravine and come again to a crossroads, where you have the opportunity for another secondary route of great interest. Turn left (north), following the signs to Demenagaki and Aghios Alexandros. When you leave the creek bed, the vegetation changes. Fires, along with intensive grazing, have degraded the vegetation to phrygana. Mastic (Pistacia lentiscus), brushwood (Genista acanthoclada), heather (Erica manipuliflora), thyme (Thymus capitatus), lavender (Lavandula stoechas) and thorny burnet (Sarcopoterium spinosum) dominate. Depending on the season, the picture of these plant communities changes. During the rainy season, everything is green. Dozens of species of herbaceous plants and plants with rhizomes and tubers appear among the phrygana. In the middle of spring a burst of scents and colors floods over Milos, in preparation for the summer, when all plants, with few exceptions, fall into a summer sleep that helps them survive the long, dry, and hot Mediterranean summer. After the chapel of Aghios Alexandros, the passable dirt road takes an eastward turn. All along the road, and all the way to the appearance of obsidian in the Demenagaki area, the rhyolitic volcanic rock has undergone silicization, resulting in the development of irregular masses of off-white flints (P9). There are also beautiful appearances of rhyolites with band / laminar flow structure in narrow, parallel, alternating bands. Looking to the southeast, you see the Mavrogianni bentonite mine at Rema, where the Milos millstone quarry also was. The millstones have a long history on the island, from antiquity to the mid-20th century, with their peak period in the Byzantine era. They were used throughout the Aegean in hand mills, water mills, windmills for grinding grain and other materials, such as in crushing olives, for leather tanning, milling salt, etc. It is worth noting that they were used from ancient times for crushing minerals (in the mines of Lavrion, Melian millstones were used for grinding the ore). In a little while the road heads towards the north, and now you’re in Demenagaki (P10), a small plateau in the middle of the east coast of the island, at an altitude of 250-300 meters, on the steep slopes of Hondro Vouno. 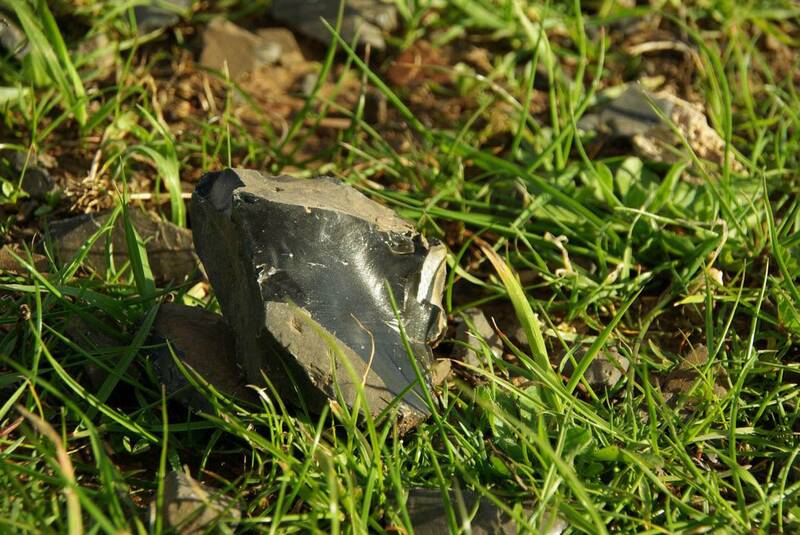 Over a wide area the ground is strewn with fragments of obsidian, the black, shiny, rock characteristic of the island. In fact, what you see is ‘debris’ from the prehistoric obsidian mining and carving workshops, from the time when Demenagaki was one of the two major obsidian quarries on Milos (the other is Nychia, northwest of Adamas). The quarrying of obsidian was carried out in small caves in the steep cliffs on the east side of the quarry, from which, out of the hard native rock, high quality “nodules” and “cores” were extracted, to be then transported by the early maritime networks (the beginnings of ‘trade’ 10 thousand years ago) throughout the Aegean, from mainland Greece to Crete. One more thing worth noting is that out of those blocks of obsidian containing rocks, various prehistoric obsidian workshops in the Aegean manufactured a wide variety of tools and weapons. From here, you can see Kimolos and Polyaegos, and when the atmosphere is clear, Folegandros, Sikinos, and even Ios islands to the east. On your left, in the area of Komia, and on your right, in the area of Hondro Vouno there are old, inactive mining operations for the exploitation of bentonite. Returning to the main dirt road, you may notice large rocks with strange shapes on the surrounding slopes. 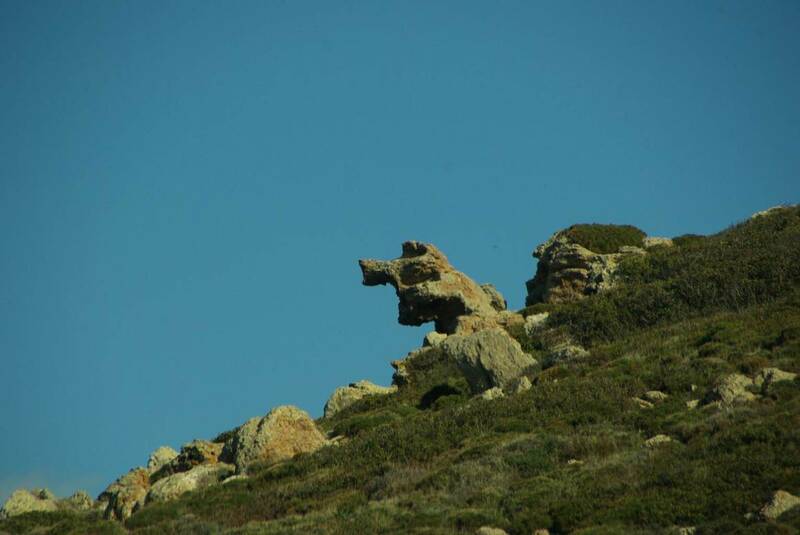 These shapes (“noches”), which sometimes resemble animal heads with open mouths, are formed through erosion caused by the sea winds blowing hard against the volcanic rocks. Going down the passable dirt road to Theioryhia, you will notice that the vegetation has been degraded, as much by fire and grazing as by the acidic soils of the area. Heather (Erica manipuliflora), thyme (Thymus capitatus), and thorny burnet (Sarcopoterium spinosum) are dominant. Along the gully that leads to Theioryhia there are mastic trees (Pistacia lentiscus) but also farming areas sown with barley and small groves of olives in sites protected from the wind. At some point, on the left side of the road, you will see a simple monument, a small marble slab (P11). On this spot one of the resistance operations against the German occupation forces was carried out on 23/12/1944. Unlike in the rest of Greece, German troops remained on Milos until May 1945, as they were cut off from joining the withdrawal due to lack of means of transport. Before and after the point (P11) there is a cluster of small artificial ‘hills’ (piles). These are remnants fromold mining operations for the extraction of sulfur or alunite (alum) in antiquity or the Roman period. From the resistance monument the dirt road descends the slopes of the Paliorema ravine and ends at old “Theioryhia” or Sulfur Mines (P12), the most significant attraction and final destination on this route. For most of its length the road is passable, except for the last 200 m. If you don’t have a four-wheel drive vehicle , it’s best to park your car at the flat area, by the last turn of the road, just above Theioryhia. As you head downhill, the old galleries for the extraction of sulfur and alum on the slopes of the depression catch your eye. Piles from old extractions, many of them underground, look like a continuous series of craters. On the bank of the south side of the road you can see kaolins and opals (amorphous silicate). The ancient Greeks and Romans were the first to exploit the sulfur in Paliorema. It was used for polishing metals, disinfecting, or for antiseptic and therapeutic purposes. Ancient Athenians, too, exploited the sulfur of Milos. The evidence of this relationship between Milos and Athens can still be found at ancient mining sites, at the Milos Mining, and Archaeological Museums, in the form of clay platters into which molten sulfur was poured to make ingots of sulfur destined for trade. Embossed inscriptions on the plates were mirrored in the turtles and left the imprint of the logo of the exploiter (e.g. NOIANITHA, i.e. ATHINAION “of the Athenians”). In more recent times, mining concessions for individuals started in 1862. In 1890, the concession passed to the Greek Society for Public and Municipal Works, until about 1920. In 1928 the company “Theioryhia Milos Inc.” took over, until 1958, when production stopped abruptly, when sulfur became a byproduct of petroleum refining at very low cost. This is still another case where the evolution of technology (desulfurization during petroleum refining) has a dramatic impact on some other activity (sulfur mining), at a geographically distant point, restricting or eliminating it completely. The bulk of the production was exported to France for use as a pesticide for the spraying (dusting) of vines. A total of 125,000 tons of ore from underground mines was transported in wagons to the crusher. It is worth noting that, once the ore was taken up high, its transfer through the various stages of processing in the plant, located to the north of the gully, subsequently advantage was taken of the sloping hill. At the base of the plant there are still remains of the autoclaves for sulfur recovery. By the sea, there was a small crane for loading and unloading. On the south side of the ravine are the buildings which housed the machine shop, plant supplies, warehouses, kitchens, dormitories, etc. 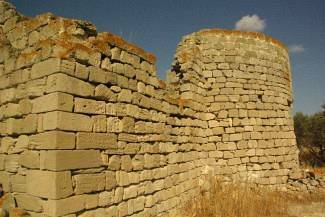 The buildings were constructed from tufa (porous stone) brought over from Kimolos. The workers lived on the premises of the sulfur mines on weekdays, leaving for their villages on Saturday afternoon to return to work again Monday morning. Working conditions in the galleries were difficult, mainly due to lack of ventilation and high temperatures. In these sulfur mines, however, generations of workers and craftsmen were trained who later manned many of the mineral processing plants in Milos. Their production and processing methods, innovative for their time (such as the method devised by Jason Svoronos which received a patent in 1938), and the unique architecture and masonry of the buildings, make Theioryhia one of the most important monuments in the industrial history of Greece. On the hill south of the Theioryhia facilities, may be seen the house where the then directorate of the firm first lived, and which later, during the German Occupation, housed the men of the German guard. Theioryhia is the only industrial complex of Milos declared as a landmark. It was declared as a historic site by the Ministry of Culture and is an important example of industrial heritage in which architecture is combined with the requirements of the production process. With Theiorychia as its final destination, our route comes to an end at a monument of modern cultural heritage. And one last but important caveat: the mining galleries are extremely dangerous, with high temperatures, no ventilation, and fumes. Visitors must not enter them for any reason.